Consulting oracles used to be difficult and dangerous. You had to make a pilgrimage plagued with hardship, trudging through the desert to a holy place or person. Or kill a calf to read its liver or a bird to read its entrails. Or study for years to read ink dropped in water. Who has the time? Traditional methods just aren't convenient today. What's a divine wonderer to do? Funny you should ask. 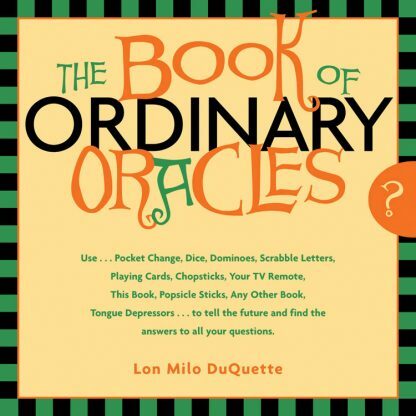 In The Book of Ordinary Oracles, Lon Milo DuQuette shows us how to use items lying around the house--from pocket change to chopsticks--to divine answer to everyday questions. He also tells us how to ask the right question and interpret the answer. The tools he provides will make consulting oracles as easy as reaching into your pocket or cupboard. Can one use channel surfing as an oracle? You bet! DuQuette's anecdotes illustrate various divination techniques. Laugh your way to wisdom while learning new ways to look at the I Ching and how to read tarot cards for yourself.